We’ve written in the past about the biases many people hold when it comes to motorcycles. We firmly believe these, and most other biases, are incorrect and unfair. Most motorcycle riders, like most drivers, are committed to safety. However, our San Jose motorcycle accident lawyer knows that it would be equally unfair to suggest all motorcycle riders are innocent victims when it comes to vehicle crashes. Dangerous decisions by riders, including speeding and riding while intoxicated, threaten the rider and others on the road. We are committed to helping those who are hurt or left mourning a love one because of a reckless or negligent motorcyclist. The San Francisco Chronicle reported on an accident that claimed one life during the early morning hours of Tuesday June 22. At around 2:30 A.M., the driver of a Honda motorcycle tried to maneuver around a Peterbilt truck travelling north on Great America Parkway (Highway 101) in Santa Clara. The attempt was unsuccessful and the motorcycle slammed into the back of a big rig truck, killing the rider. According to the California Highway Patrol (“CHP”), after the initial collision the body of the 23 year old motorcycle rider lay in the street and was hit by other vehicles. CHP Officer Ryan Fifield told reporters that several witnesses said the motorcycle had been travelling in excess of 100mph when the crash occurred. No other injuries have been reported. Excessive speed is dangerous, whether you are on two wheels, four wheels, or more. In June 2014, the National Highway Traffic Safety Administration’s (“NHTSA”) released a safety fact sheet on motorcycles based on 2012 data. The NHTSA deems a crash speeding-related if an officer charges someone with a speeding offense or if the officer indicates that racing, travelling too fast for the conditions, or exceeding the speed limit contributed to the collision. 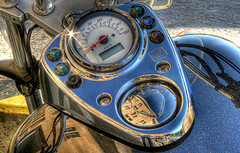 For 2012, 34% of motorcycle operators involved in a deadly accident were speeding. This is in comparison to 22% of passenger car drivers, 18% of drivers of light-trucks, and only 8% of large-truck drivers (the final group is likely much lower because of job requirements for commercial drivers). Notably, the statistics on alcohol impairment are not unlike those for excessive speed. When looking at the characteristics of those involved in fatal crashes, the NHTSA found that a higher percentage of motorcycle operators were legally intoxicated than any other type of vehicle operator. More specifically, 27% of motorcycle riders involved in fatal crashes had a blood alcohol level at or above 0.08, compared to 23% of passenger car drivers, 22% of light truck operators, and 2% of the drivers of large trucks. These NHTSA statistics confirm what our experience in accident law and even a quick review of accident headlines suggest – speeding and/or drinking make motorcyclists more likely to be involved in serious accidents. While most riders (like most drivers) are committed to safety, others engage in dangerous or simply careless behaviors that put themselves and everyone else on the road at risk. If a motorcycle rider caused an accident that left you injured or grieving, call our San Jose personal injury law office or any of our other Northern California locations. We can help you recover compensation from the at-fault rider, money that will help you move forward from an unexpected tragedy. An added note — The Brod Firm supports riders who make safety a priority and we are committed to helping erase biases that paint all riders in a poor light. Reckless riders give all motorcycle operators a bad name and that is one more reason we are also committed to holding motorcycle riders accountable when they cause accidents that leave others injured or dead.